Ukrainian journalist Osman Pashayev reported on his Facebook page. Khan Palace Museum has been closed for 4 days under the pretext of preparation to centenary and the guard was posted on all sides, the journalist wrote. 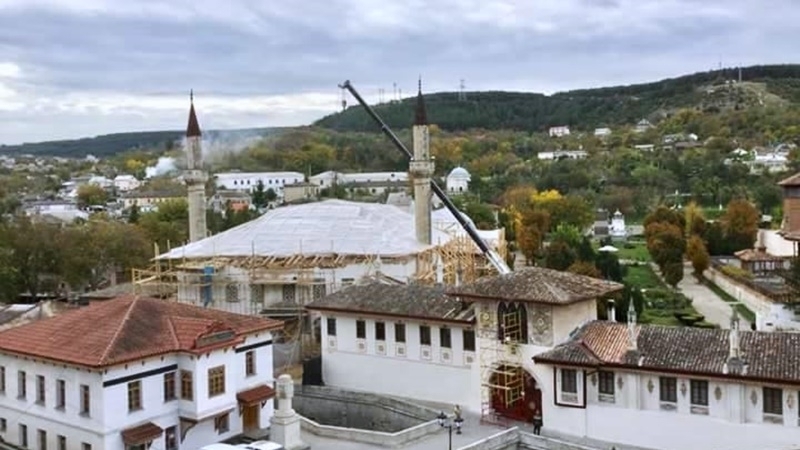 “Not only all the roofing tiles were removed from the Buyuk Khan Jami (Big Khan’s Mosque) (it was taken down, and it might be moved to Chufut-Kale) but they also removed the old oak beams under the pretext of ruining by beetles. The beams are huge and thick. Forged nails are stuck all around the beams. The 18th centuries murals were damaged on the facade while the beams were removed with the truck crane. The whole facade from the street view has been washed with the high-pressure cleaner, which caused cracks and the plaster fell to the very stones just at the entrance near the gate, the masonry was visible. This hole was immediately covered with cement and the entire facade was covered with modern paint and the ground coat. The Aleksandr Fountain has been washed with the high-pressure cleaner! Some pieces fell off, they covered these pieces and now staining with modern paint in white color. ”Katerynivska mylia”, monument of history and architecture built in 1784-1787 on the proposed route of the empress Catherine the Great from St. Petersburg to the Crimea, has also been washed with Oxalic acid and high-pressure cleaner. The paint is peeling. All paintings on the facades are urgently daubed by ordinary workers. It is not matter of involving the restorers at all,” Pashayev said. In addition, the palace could collapse due to the "new construction", such as metalwork with a roof around part of the palace, he noted. The Khan Palace was founded in the 16th century during the reign of Sahib I Giray khan. The palace is part of the Bakhchysarai Historical and Cultural Reserve. In the premises of the palace include a museum of history and culture of the Crimean Tatars, an art museum, an exhibition of cold steel and firearms.